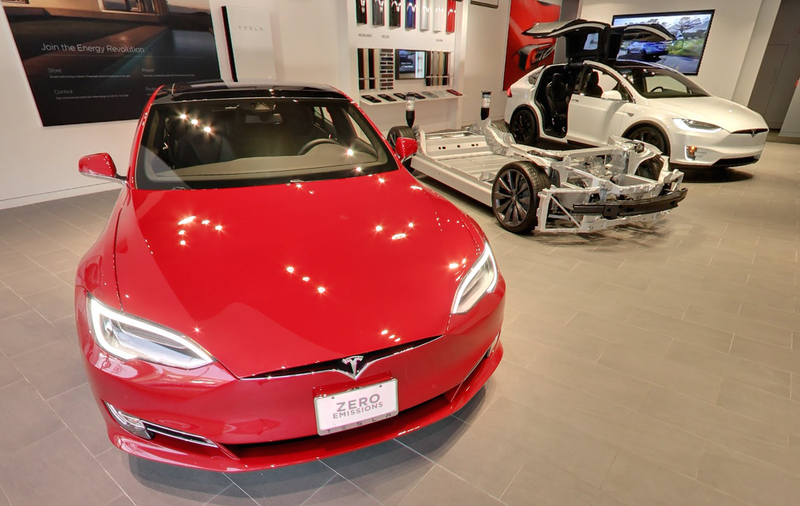 Tesla was green lit to open a gallery store in ultra-posh Greenwich, Connecticut a little over a year ago with the stipulation that the company didn’t actually sell cars out of it. It works that way in many states where Tesla is barred from directly selling cars, rather than going through franchised dealers. Now Connecticut is moving to shut down Tesla’s gallery, and the automaker says other dealers went to extreme lengths to make that happen. But Tesla says sinister tactics were at work here: that the Connecticut Automotive Retailers Association sent “secret shoppers” to the gallery to repeatedly attempt to buy a car from employees, the newspaper reports. “It sent ‘secret shoppers’ to the Greenwich gallery in a failed attempt to trick our local employees into selling them a vehicle,” Diarmuid O’Connell, Tesla’s vice president of business development, wrote legislative leaders. To recap: Tesla sells its cars directly, often via its website, to customers rather than through dealers. Dealers don’t like that, so they’ve fought against this method in many states. Some states allow direct sales; others, thanks to a well-monied and powerful dealer lobby, require automakers to franchise sales out, hence the Tesla gallery stores, which show off Tesla cars and their features but don’t let you actually buy a car. Tesla’s position is that Connecticut’s laws prohibiting it from selling cars are ridiculous in the first place, but have been followed nevertheless. Such restrictions do seem a little silly, since people can easily go to New York or Massachusetts, where Tesla’s direct-to-customer sales are permitted. But Tesla’s direct-to-customer model cuts out a traditional car dealership’s opportunity to make money, so I can’t blame the local dealer’s association for fighting to keep Tesla at bay. In a blog post against Tesla, CARA member David Baeza posits: “Consumers get the best deals because of competition between dealerships—in sales and service—and that doesn’t happen in Tesla stores.” Baeza also cites the number of jobs that Connecticut car dealerships provide as a reason to stick to the status quo of car sales. Other public CARA statements have a similar tone: Tesla is the evil carpetbagger, local car dealerships provide important jobs for the state. Even if Tesla cars aren’t direct competitors to whatever local dealers are selling, the potential success of the direct-to-customer sales scheme could pave the way for an industry-wide reshuffling of how cars are sold. As it stands, the Connecticut DMV has reportedly issued a “cease and desist order to the electric car manufacturer on its Connecticut sales.” With its letter to state legislators cited above, Tesla will now move to prove it has not made sales in Connecticut while fighting against these regulations prohibiting the company from doing so.